Radio Control or R/C is just the name of a system that uses various radio waves to control some sort of device. These systems modulate and transmit radio waves similar to the radio waves your AM or FM radio in your car or home receives. The only real difference is the frequency at which they operate and the technique used to transmit those radio waves. Also contained within that radio wave are a set of individual 'channels' that allow multiple signals to be sent with one radio frequency. In radio controls used in modelling, there are two basic components: a transmitter and receiver. The transmitter is what you hold in your hand and the receiver is what you put in the plane. For many years, transmitters sent signals out on one specific frequency and the receiver was tuned to listen to just that frequency. Now we have spread-spectrum transmitters that 'match' a particular transmitter to a receiver by sending a specific sequence of these radio waves so that no other receivers can detect meaningful data. In either case, once the receiver, either traditional or spread-spectrum receives the signal from the transmitter, this is translated them into movement of motors on board the plane. Those motors are known as servos and rotate (or move) as the control levers on the transmitter are moved. You connect the servos to different control surfaces on the plane such as the rudder or elevator. So, when you move the 'rudder stick' on the transmitter, the rudder moves on the model, and so one for each of the transmitter controls. Typically, a radio system package comes with just about everything you need to install and use a radio with a model. Novice or beginner sailplanes usually need only 2 channels of control, but you are still better off purchasing a radio with at least 4 channels of control. Most 4-channel radios come complete with nickel-cadmium or other type of rechargeable battery packs that are reliable and can give many years of service. Many of these radios also can come with internal electronic servo mixing options, useful on V-Tail and Elevons. There are still brands of radios that are advertised as 2-channel units, have 2 control levers, but the lever on the left only moves up and down and is for is for elevator (up and down) control only. The lever (or stick) on the right only moves right and left and is used typically for rudder only. These are also known as '2-Stick Transmitters' and are is NOT the preferable configuration for most pilots and it can be difficult to find a fellow pilot who will (or even can) fly with this setup. I really wouldn't recommend buying one of these style radio transmitters as I think it will frustrate you. There are 4, 6, 7, 8, 9-channel transmitters (and receivers), up to about 14 channels in expensive systems. There are also a completely different class of radios used for cars and boats known as 'Pistol Grips', but they also operate in the same basic manner. Most better radio systems have at a range of at least a half mile or more (in the air). This means that as long as you can see your plane, you still should be able to control it. Some radios have the additional capability of connecting one radio transmitter to another to help the beginning pilot learn. This capability is sometimes known as a trainer or 'buddy box'. A cable connects two transmitters of the same brand and pressing a switch on the main transmitter, allows the other control over the plane. If the plane 'gets into trouble', the person helping teach the beginning pilot just releases the switch on the main transmitter and regains control of the plane without incident. The only problem with this technique is that you need two transmitters of the same type as different brands or types of radio transmitters often cannot be used together as a buddy-box setup. Also, there is a 'Trainer Buddy Box' where this can be connected to a functional transmitter, but on its own, doesn't actually transmit any radio signals (and it's cheaper than buying another transmitter). ** Spread-spectrum radios are now available in very low cost models, sometimes as little as $50 for the entire package. As was mentioned before, up until recently, there WERE two modulation methods, AM and FM, just like the radio in a car. And just like in a car radio, AM signals are noisier and therefore less reliable in a place where there are a lot of radio signals nearby, such as a crowded field. The FM signal can also be modulated in a digital form where there are individual pulses sent rather than just a waveform. This is known as PCM (Pulse-Coded-Modulation). I have found that PCM receivers are a bit heavier and haven't really helped with my flying experience. I know there are many people out there, mostly those that fly helicopters, that wouldn't use anything else over PCM. For sailplanes, typically only AM and FM radios were used as PCM circuitry tended to be heavier and really doesn't add tremendous benefit. PCM circuitry (and FM) is used and sometimes required on aircraft that have electric motors or gas engines. This is due to the added radio frequency noise (also known as RF noise) that tends to be generated by those setups. Sailplanes aren't infallible though, as some control linkages for controlling even rudders or elevators can generate RF noise, especially if the linkages have metal to metal connections. The bottom line is that you can usually get away with a FM radio control system or even AM radio system, if you have a simpler setup with minimal metal-to-metal linkages (unlike a helicopter which can have many). 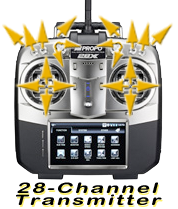 I only have one PCM radio system and my personal experience with it hasn't been that great. I've been completely satisfied with FM modulation. But, we now have Spread-Spectrum radio systems available today, and have many distinct advantages. For many years, there were only radios that transmitted in a narrow range of frequencies, different in different countries. The USA had a couple of ranges, 26 MHz and 72 MHz bands, and if you had a HAM-Radio license, you could also get and use a radio on 53 MHz. Before spread-spectrum radios, pilots whose radios were on the same frequency had to take turns as only one pilot can use their transmitter on that one frequency at a time. Now that we have spread-spectrum systems, each transmitter-receiver pair essentially is on its own frequency. Pilots that have spread-spectrum radios no longer have to find out what frequency other pilots in the area have and can fly without worry of interference as in previous radio systems. Most spread-spectrum radios transmit on a 2.4Ghz frequency. The only major disadvantage of the spread-spectrum radio technology is that most of the time, you MUST use the same manufacturer of the spread-spectrum transmitter matched with same manufacturer's receiver. There doesn't appear to be a particular standard in spread-spectrum transmission [yet]. With previous radio systems you could mix a Futaba FM transmitter with, say, a Hitec receiver and get perfect results. JR and Spektrum radios are from the same internal manufacturer so those spread-spectrum receivers seem to be compatible. Also, one thing nice about the Spektrum receivers is that some of the lightweight receivers have internal voltage regulators - which means you can connect a lightweight 2-cell Lithium Polymer (LiPo) pack that normally would supply 7.4 volts, blowing up many other brands of receivers. For those of you that keep seeing older, discontinued Futaba radios in the hobby stores, here's some of my descriptions about those radios. There are others too, but I don't have pictures of all of them, sorry.